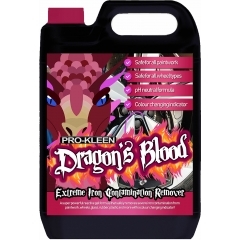 Pro-Kleen’s range of iron fallout contamination removers is the perfect way to breathe new life into dull and discoloured wheels. 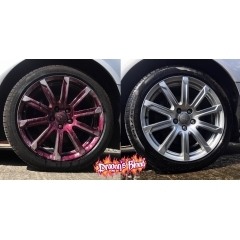 A quick 5-minute treatment from our fast-acting iron fallout removers is all it takes to clean up drab wheels, so you never have to let poor wheels drag the look of your car down ever again! Iron fallout (or iron contamination) occurs when small particles of iron wear away from your brake pads and cling to your wheel trims. Over time, this leads to your wheels looking dull and yellowish, and no amount of cleaning seems to brighten them up. This means you can use all the snow foam, shampoo, and wax you like, and while the rest of your car will look glossy and shiny, your wheels will still look drab and dirty! 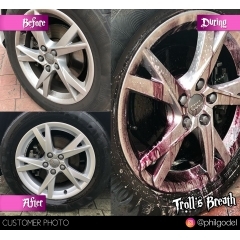 Our iron fallout removers – the fast-acting Troll’s Breath and the super-strong Dragon’s Blood – will quickly break down iron contamination on your wheels and leave your wheel trims gleaming again! They both use a colour-changing indicator so you can see the magic happening before your very eyes. After a few minutes, rinse down your wheels to be left with alloys or wheel trims that look like new again! All our iron fallout removers are pH neutral and can be used on wheel trims, alloys, paintwork, glass, plastic, and rubber, too! 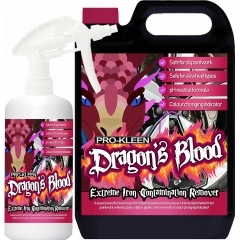 If you find that the iron contamination is causing discolouration on other parts of your car, just spray on some Troll’s Breath or Dragon’s Blood to get rid of it quick. 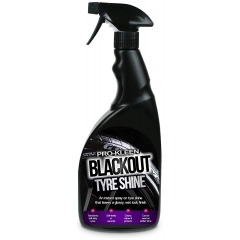 Add the finishing touch to a detailing session with a dose of our tyre shiner. 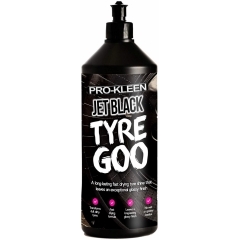 With the convenient Blackout tyre shine spray and the ultra-thick, fast drying Tyre Goo to choose from, you never have to let scuffed, dirty tyres spoil the look of your car again. 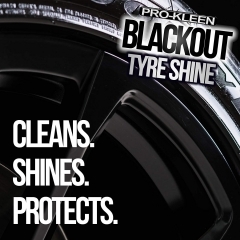 Our tyre shiner adds a layer of deep black gloss to your tyres which, when finishing off a full Pro-Kleen detailing session, will make your car look like it’s just rolled out of the factory.